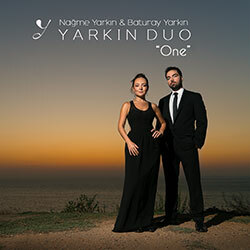 As siblings born and raised in the same house, we brought together two instruments from differing traditions, the piano, and the classical Istanbul kemenche and formed Yarkın Duo. Independently and in unconventional ways, we focused solely on the music that resonated with us in creating our compositions and recorded our first album One. In this album, you are invited to listen to our improvisations, which are reflecting the remembrance that music is not different than speaking and expressing ourselves. We have been giving our dedicated care to reflect the authentic sounds of our instruments in our recordings. In our playing together, you can find rhythms that source from both Turkish music and in between those rhythms you can also find Jazz sounds as well as influences from the Classical Western music tradition. To those who have been with us from the first breathe we exhaled into life in our journeys and who have been unconditionally supporting and enlightening us with their infinite love, beautiful ideas and invoking inspiration, our beloved parents Füsun Yarkın & Fahrettin Yarkın, to the one who supported us with his ideas as an invisible third member of our group, our sound engineer and dear friend Sertaç Kakı, to Abdullah Geels and AudioMaze who believed in our music and transmitted it to digital platforms, to the beloved Ahenk Music family who encouraged us to realize this album from the first moment they heard our music, to the beloved Dalkıran family for their heartfelt lifelong support, and to Gözde Can Kakı and Emrah Günaydın ve express our deepest gratitude.